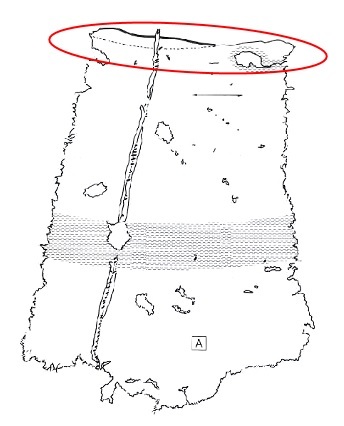 The favorable aspect of the Haithabu harbour findings is the possibility that the fragments originate from everyday clothing that had been spared to use as ship’s caulking, in contrast to the grave findings which more likely would’ve represented the finer wardrobe of their owners. Two of the textile pieces the harbour has yielded are smokkr fragments of fine repped wool, both pieces dyed brown using walnut. My smokkr is sewn in Korp‘s brown herringbone wool mix Vide 02. Since it’s sewn to be sold to someone else (and I’m pregnant and can’t fit into the dress at the time I’m posting this) I unfortunately have no pictures of the dress while on the body. The suspenders are sewn in the same wool as the rest of the dress. They measure approx. 120 cm long, are folded in four, stitched together along the long side and folded double creating approx. 60 cm long loops, attached to the back upper hem of the smokkr. Identical 8 cm long loops were made for the front of the dress. The position of the straps on the back of the smokkr is based on the fragment below (Hägg, 1974, p. 38-42). 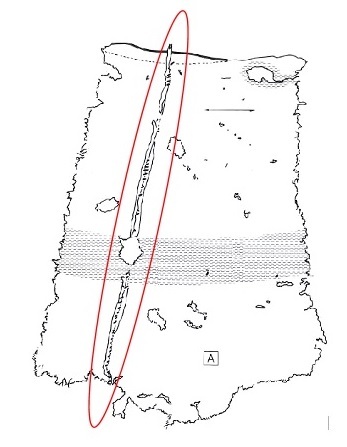 When you look at fragment A, which is the larger piece of a backside of a smokkr, you see a dart running parallell to the straight side of the fragment, from 7 cm below the upper edge through the tear at the bottom. If the dart continued to the hem of the skirt is impossible to say. The ridge of the dart is placed on the outside of the garment, unlike modern garments where most adjustments are hidden on the inside. I’ve reconstructed the dart from 8 cm below the upper edge of my smokkr, running down 25 cm before ending on my lower back, giving an aesthetic detail. The upper edge is folded about 1 cm towards the inside and stitched in place using hemming stitches. On the right top of the fabric is a circular hole, possibly a tear from a tortoise- or other brooch. 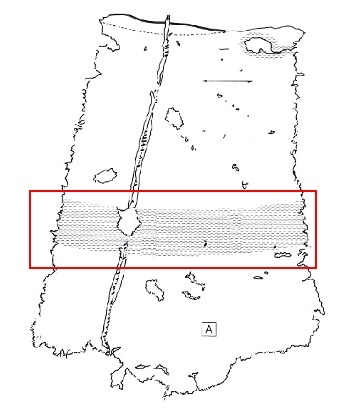 The felted area, highlighted above, would have appeared in waist height and which in my opinion could be a sign that the smokkr was worn with a belt of some sort. Due to the slim shape and no use of gores; the smokkr isn’t floor- or ankle length, as that would reduce the range of motion, but instead reaches only mid-calf.